Even though our lives on Irie are nothing like the lives of people living on shore, we do have one big thing in common: the weekend! Even more: the weekend to look forward to. 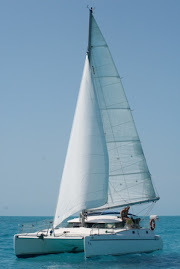 During the workweek, Mark and I are extremely busy with the business, writing assignments, boat projects and errands, moving about different bays and the usual housekeeping and shopping. But -since leaving St. Martin- once Friday night comes around, we (I) am ready to have fun, chill and hang out with friends. During our stay in Clarkes Court Bay, Mark and I checked out Nimrod’s Rum Shop in the tiny settlement of Woburn, one evening. We met Sep, the owner, and he invited us over for a party he was throwing the following Saturday. It was a reason to stay in the area and postpone our return to familiar and rolly Prickly Bay. We convinced our friends Sim and Rosie from SV Alianna (and it took a little bit of convincing, but the promise of free food and an invitation on Irie for brunch did the trick – did I ever mention that Rosie LOVES food as much as I do?) to come around the corner and join in the local festivities, not exactly knowing what to expect. On Friday night, Mark and I were invited for martinis on SV Gypsy Blues, which started the weekend off right or right off. Saturday brought crappy weather and just when Rosie and Sim arrived in our pretty, but small bay, two French boats barged in, threw out anchors and took up the rest of the space. Seemingly unstoppable rain arrived and I hoped our friends didn’t regret leaving their roots in Prickly Bay. Thunder and lightning accompanied the downpour and things got a bit scary for a while. But, the gods didn’t want us to miss our unconventional Nimrod experience, so right around 5pm, the sky cleared up. Our dinghy collected enough water to take a bath in, but we had other plans… After Mark bailed it out and pumped it up, it was rum time! The four of us received a warm welcome in Nimrod’s Rum Shop from Sep and a cheery (and loud) man named Sheldon. After settling in the “court yard” with our drinks, we chatted the night away, being the only white faces in the bar. A couple of local guys were preparing the free food for the night: a big pot of oil down, the local Grenadian dish consisting of callaloo, breadfruit, root vegetables, dumplings and “meat”, which we were told was chicken and pork. They invited us to look into the pot and be part of the process. Once the music was turned up (read: up up up) and no conversations could take place anymore, our little group, by now expanded with Astrid and Bjorn from SV Buena Vista, moved under the big breadfruit tree, where the evening continued. Before long, we were served plates of oil down in the company of Sheldon and Renny who kept us entertained with stories. A “slightly” intoxicated Sheldon sang some famous hit parade songs for us and made sure we were paying attention to everything he said. Generously, he refilled our “quarter of rum” bottle, which soon turned into a full size bottle. Hungry as we were, we gobbled the food down, without asking too many questions or thinking too much about the contents. When I jokingly asked before whether the oil down would contain chicken feet or fish eyes, the shocked answer was “No, of course not, it has chicken necks, pig snouts and pig tails”. Luckily it was dark by then, so we barely saw what made its way into our mouths. And, a very grateful stray dog hung out between our chairs, devouring the fatty bits. As the evening progressed, we were offered a second dish, fish broth. As far as we could tell, it existed of sea urchin and squid. It did taste very good to Rosie, Mark and me, who gratefully finished the whole thing. Sim –who doesn’t eat fishy stuff- declined. He filled up on the meaty parts before, which he really enjoyed and hopes to prepare himself one day. The rain came and went and when “cruiser’s bedtime” (10pm) came around we said goodbye to our new friends and thanked everybody for a wonderful evening. The hospitality we encountered was one of a kind and we truly enjoyed the local experience. Sunday morning started with a yummie brunch on Irie. Sim, Rosie, Jan and Susan (SV Peter Pan) and later Bjorn joined us on board for food and relaxation. In the afternoon, the girls walked and the boys dinghied over to Roger’s Beach Bar on Hog Island, where the weekly BBQ and party took place. We ran into old and new, western and local friends and had a nice afternoon. The drinks went down easy, the live reggae music was groovy, but we passed on the food which was a bit pricey. Instead, we all returned to Irie for some wonderful fajitas. It was a great and social end of a great, social, fun and tasty weekend!